Wag magpahuli sa latest showbiz chika online! Mag-PLDT myDSL modem+wifi in ONE na! Sa bilis ng pagkalat ng information ngayon sa internet, lalo na ang mga showbiz news and other chikas, hindi kataka-taka kung lahat tayo nagkikita-kita na ngayon sa cyberworld! Kaya naman very convenient na ngayon kung naka-wifi kayo at home right? Pero minsan di ba hassle yung may wifi modem na kayong pina-plug, meron pang router. 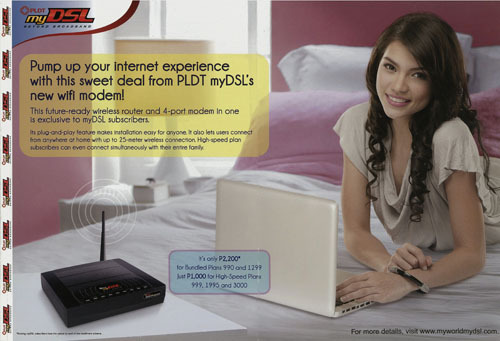 Pero don't worry, dahil tulad ni Rhian Ramos, pwede niyo nang mas pabonggahin ang inyong internet experience ngayon! Dahil ang PLDT myDSL ay nag-launch na ng kanilang wifi+modem in one! Subscribers can now enjoy their high speed connections at home without being tied down to a cable. It's the first modem-and-Wi-Fi router-in-one from PLDT. Sleek, innovative, and future-ready, the Wi-Fi Modem is available with PLDT myDSL bundled plans 990 and 1299, allowing you wireless broadband access anywhere at home. And beyond the convenience of portability, subscribers of myDSL Plans 999, 1995, and 3000 get to avail themselves of a modem that can accommodate up to four wired and multiple wireless connections. Your entire family can go online using your desktop computers, laptops, and mobile devices simultaneously. O di ba ang saya! Kaya I'm sure with this innovation, mas madali at mabilis na ang pagdating sa inyo ng mga latest happenings sa showbiz world, at mga insider chikas from darlasauler.com! Go!